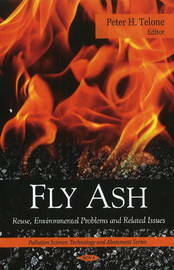 Fly ash is one of the residues generated in the combustion of coal. Fly ash is generally captured from the chimneys of coal-fired power plants, and is one of two types of ash that jointly are known as coal ash; the other, bottom ash, is removed from the bottom of coal furnaces. Depending upon the source and makeup of the coal being burned, the components of fly ash vary considerably, but all fly ash includes substantial amounts of silicon dioxide (SiO2) (both amorphous and crystalline) and calcium oxide (CaO). Toxic constituents include arsenic, beryllium, boron, cadmium, chromium, chromium VI, cobalt, lead, manganese, mercury, molybdenum, selenium, strontium, thallium, and vanadium, along with dioxins and PAH compounds. In the past, fly ash was generally released into the atmosphere, but pollution control equipment mandated in recent decades now require that it be captured prior to release. In the US, fly ash is generally stored at coal power plants or placed in landfills. About 43 percent is recycled, often used to supplement Portland cement in concrete production. It is increasingly finding use in the synthesis of geopolymers and zeolites.